On board Finao Sportfishing’s Cobia fishing charter it is one of the best Cobia fishing boats in the Virginia waters. Our boat is located at Vinings Landing Marina. The marina is located in the center of the Chesapeake Bay home to one of the best locations to target Cobia. Our Cobia fishing Charter runs all summer long. The Cobia fishing season in Virginia begins around Memorial Day and last until late September. 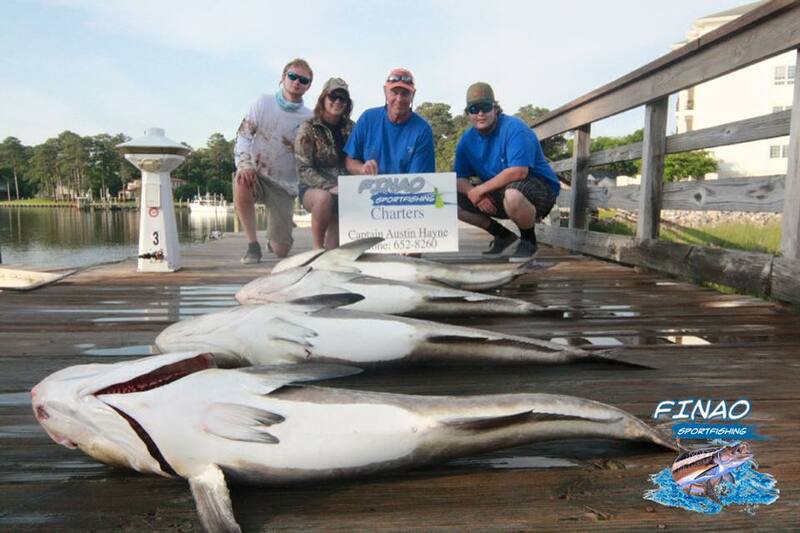 To see what its like to be on Finao Sportfishing Cobia fishing charter click here! On board the Cobia fishing charter we will be doing two different effective techniques to catch these fish Chumming and Sight Casting. Cobia range in size from a small Cobia being around 10 pounds. These fish once full grown can exceed 100 pounds! They are also known for there long and powerful runs that will never give up. On our Cobia fishing charter we will be providing you with the top of the line gear to be able to catch these strong fish. The gear that we will be using are Saltist Spinner Reels, Shimano Rods, Ugly stick rods, Power Pro braided fishing line, and 10/0 Owner hooks. When targeting Cobia it is important to have the correct baits for certain situations. Cobia feed on Menhaden, Atlantic Croaker, Spot, American Eels, Blue Crabs, Shrimp, and many other small fish. When Cobia fishing we will provide you with the best baits and lures for the situation. We use 2 / 3 ounce Bucktails which is a great way to mimic a small wounded bait fish. For the bigger fish we use live baits such as American Eels and Atlantic Croakers. Depending on the time of year it makes a difference on how and where we will be fishing for Cobia. In May – June usually you will be finding your bigger Cobia. They are much larger in the earlier months since they have not yet spawned. When fishing the early season they are moving fast to migrate into the Chesapeake Bay. We will be targeting them along the Chesapeake Bay Bridge Tunnel and into the Atlantic Ocean. In the later seasons July – September we will be targeting them in the Chesapeake bay and along the Chesapeake Bay Bridge Tunnel. So when looking to target these big and powerful fish book your trip with Finao Sportfishing!